Autism Light #131 is Olaf Kolzig. Olaf "Olie" Kolzig is a German citizen who was born in Johannesburg, South Africa. He currently lives in the Washington DC area. Olaf Kolzig has a son named Carson who has autism. Olaf was a professional hockey player who played 17 years in the National Hockey League. Olaf Kolzig is an Autism Light because of the personal impact that his foundation and humanitarian work is doing for the cause of autism. The following is a heartwarming news story done in 2008 on the impact Olaf Kolzig had on the Atmore-Gilbertsen family from Arlington, Virginia. Athletes Against Autism: In 2006, Olie Kolzig founded Athletes Against Autism along with fellow hockey players Byron Dafoe and Scott Mellanby. If one looks closely at the photo at top of this post, one can see the logo for Athletes Against Autism that Olie Kolzig passionately wore on the back of his helmet when he played. Athletes Against Autism is now associated with Autism Speaks and is responsible for helping athletes make positive contributions to autism awareness. Also, in 2006 Olaf Kolzig received the King Clancy Memorial Award by the NHL for his humanitarian work. ECHL: Before playing in the National Hockey League, Olie Kolzig played two seasons in the ECHL. In 2010 Olaf Kolzig was inducted into the ECHL Hall of Fame. The following is his Hall of Fame Tribute Video. 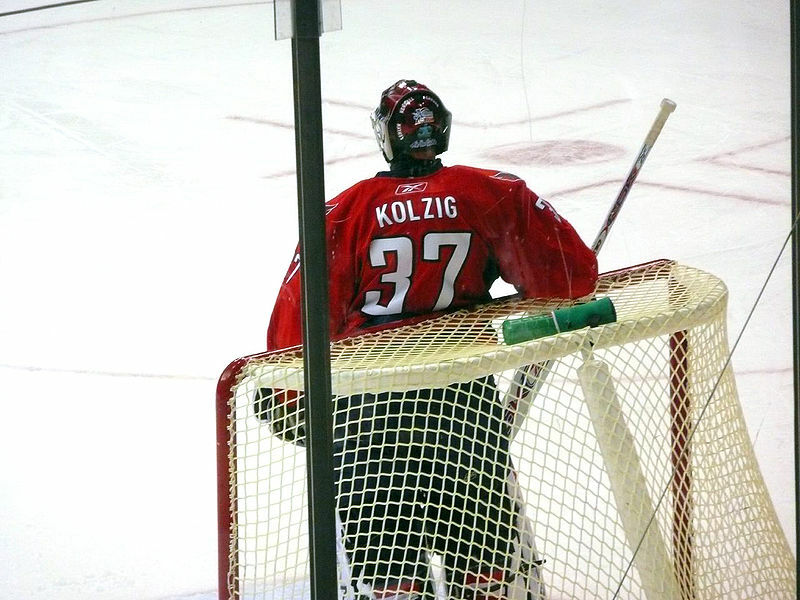 NHL: Except for a brief final season of 8 games with Tampa Bay, Olie Kolzig played his entire NHL career for the Washington Capitals as a star goalie. His 303 wins puts him in the top 25 all-time for NHL goalies. In 2011 he returned to the Washington Capitals to work as their Associate Goaltender Coach. Carson Kolzig Foundation: Olaf Kolzig started the Carson Kolzig Foundation in honor of his son who has autism. The website for the Carlson Kolzig Foundation is at http://carsonkolzigfoundation.org. According to the website the "Carlson Kolzig Foundation is a nonprofit, community based organization in Tri-Cities, Washington, dedicated to education and resources for individuals with autism spectrum disorders and their families." The Carson Kolzig Foundation developed the Responding to Autism Center to help meet needs of families with autism. The following is a video about the Responding to Autism Center's work. Social Media: You can follow Olaf Kolzig on the following social media areas. Special thanks to Olaf Kolzig for using his athletic star to be an Autism Light. His diverse international background is a testimony to the fact that autism knows no geographical boundary. Photo: The photo of Olaf Kolzig in this post was taken from the Creative Commons of Wikipedia. We Treat Subjects on this Blog Like Family, and Visitors like Friends. Will You Be Tomorrow's Autism Light?